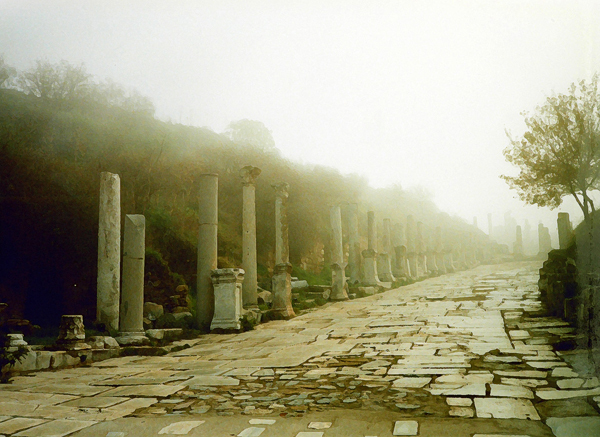 Curetes Way, a main boulevard of Ephesus, leading from the Temple of Hadrian to the Library of Celsus. 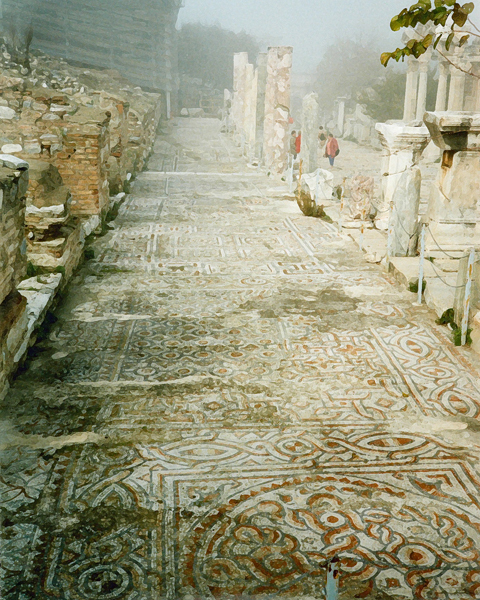 Even with only about 15% uncovered, Ephesus is one of the most extensively excavated Greco-Roman sites in the world. 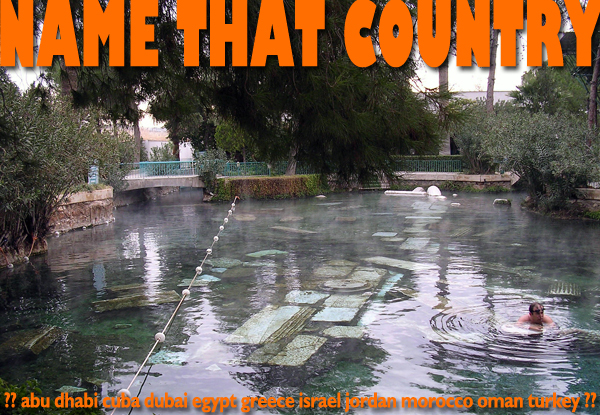 The city was established by the Greeks in the 10th century BCE. By the Roman period, Ephesus was the 2nd largest city in the empire, with a population of 250,000. After Alexandria, it was the 2nd largest port in the eastern Mediterranean. The Temple of Artemis at Ephesus was one of the 7 wonders of the ancient world. Today, only the footprint of that temple remains but there’s so much more to see, you won’t notice it’s missing. Ephesus is an important pilgrimage site for Christians for several reasons. Paul the Evangelist spent time in the city. In fact, he was driven out by an angry mob of craftsmen who feared his preaching would negatively impact their sales of Artemis figurines. Paul wrote his Letter to the Ephesians to the church he established at Ephesus. The church at Ephesus is one of the 7 addressed in the Book of Revelation. The Apostle John is also believed to have spent time in Ephesus and his tomb and the remains of a basilica dedicated to him are there. On a piney slope a few miles from the archaeological site is the House of the Virgin Mary, believed to be where Mary spent the last years of her life. Ephesus is located in western Anatolia (Asian Turkey) about 5 miles in from the Aegean coast. 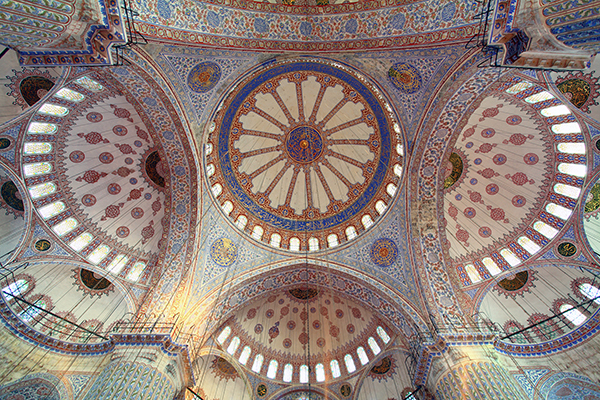 The town of Seljuk is about 2 miles away and the larger port town of Kusadasi is 12 miles away. The closest airport is 25 miles away at Izmir. Pergamum is an ancient Greco-Roman city in western Turkey, about 15 miles from the Aegean coast, 60 miles from Izmir, the closest airport, and 110 miles from Ephesus. The modern town on the site is Bergama. 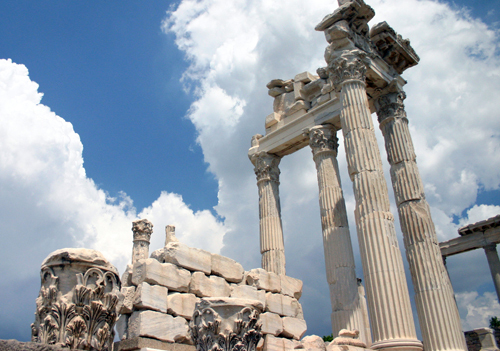 From the 2nd century BCE through the 2nd century CE, Pergamum was among the most culturally influential cities in the Mediterranean region and reached a population of 200,000. The library at Pergamum was the largest after that of Alexandria and legend tells that, for a wedding present, Mark Antony gave Cleopatra the contents of the Pergamum library to insure the uncontested cultural prominence of Alexandria. 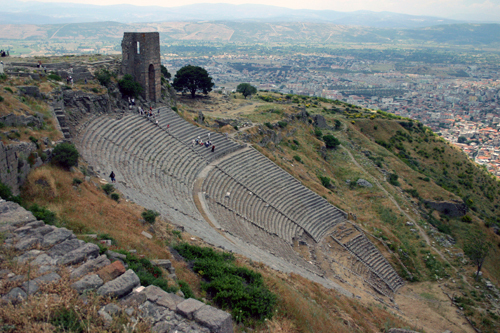 Most of Pergamum’s remains are on its acropolis, 1,000 feet above the valley floor. The most prominent site atop the acropolis is the Temple of Trajan, which is gradually being reconstructed. Scant remains of the Temple of Athena and the Pergamum Library are also there, as well as a monumental gate and tombs of Hellenistic rulers. The theater spills down a steep slope and takes solid nerves to explore. The Temple of Dionysus, the foundations of the great Altar of Zeus and the agora are terraced into the slope. In the valley, about 2 miles from the acropolis, the Sanctuary of Asclepius, the god of healing, was a very popular spa and health center in the 2nd century. 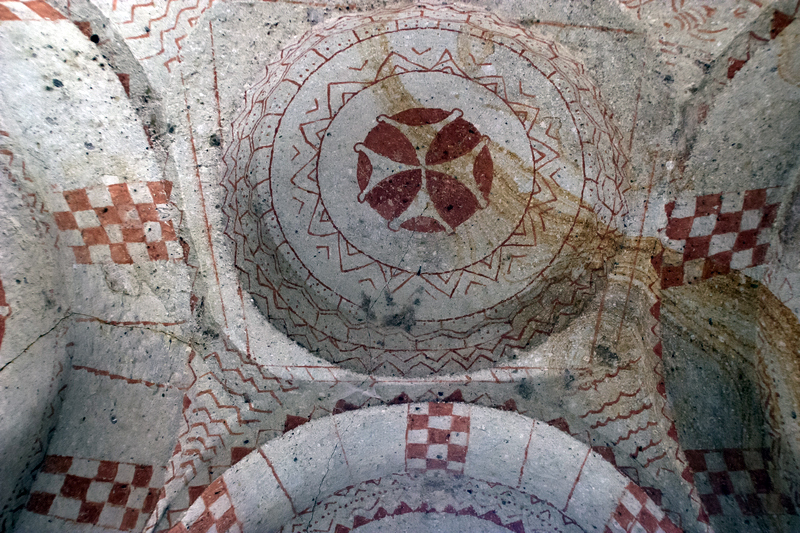 Less than a mile from the acropolis is the Red Basilica, built as a temple to the Egyptian gods Serapis and Isis and converted to a Christian church in the Byzantine era. 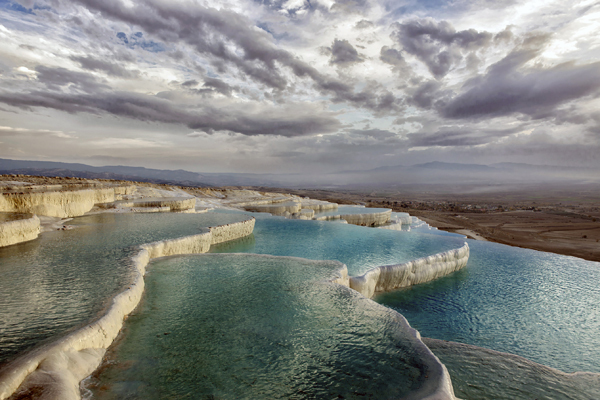 Pamukkale is located in southwestern Anatolia, a 4 to 5-hour drive inland from coastal attractions such as Ephesus, Bodrum, Marmaris and Antalya. The closest major attraction is Aphrodisias, roughly halfway between the coast and Pamukkale (less than 2 hours driving). Pamukkale is known as the “Cotton Castle” because of its dramatic travertine terraces formed by hot spring deposits of calcium carbonate. The Romans built the thriving spa town of Hieropolis here and besides the natural wonders there are some nice ruins to explore. 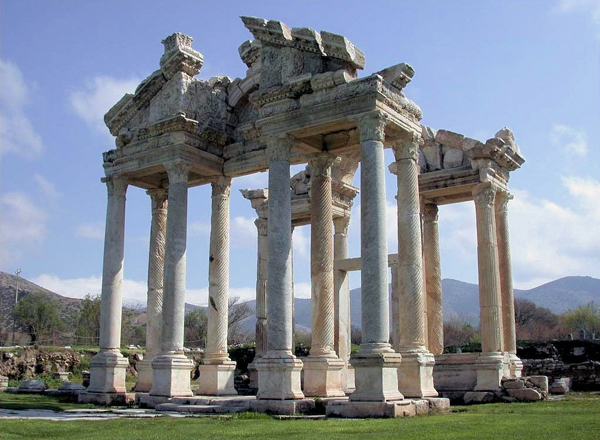 The site of Aphrodisias in south-central Anatolia (Asian Turkey) was a major cult center of the regional version of Aphrodite, the Greek goddess of love and fertility. Around the 3rd century BCE, Aphrodite was merged with the local Great Mother goddess of fertility, worshipped here in the lush Dandalas River Valley for more than 5,000 years before the Greek pantheon settled in. 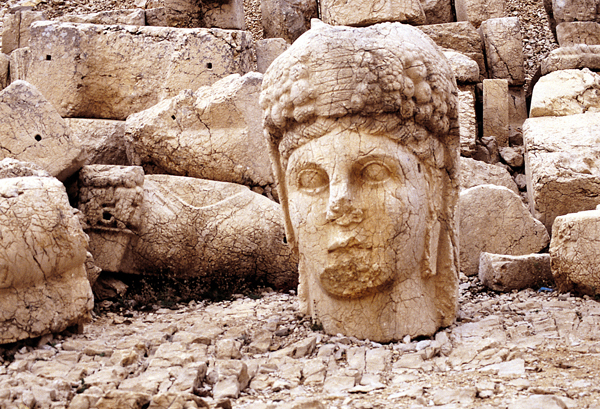 Ancient Aphrodisias was a bustling, cosmopolitan city and the remains are some of the best in Turkey. The tetrapylon (monumental gate) is the most photographed element, for good reason, but an extensive site unfolds from there. 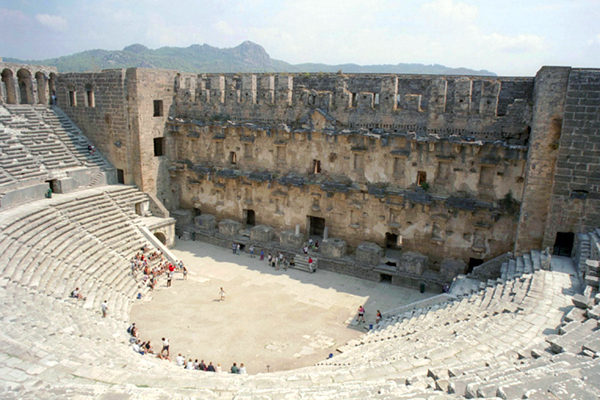 Don’t miss the exquisite little theater (odeon), the large stadium and, of course, the Temple of Aphrodite. The famous Aphrodisian marble, from a quarry just down the road, inspired a prolific local arts scene and was exported across the Roman Empire. The excellent on-site museum is chock-a-block with marble sculpture, reliefs and inscriptions. 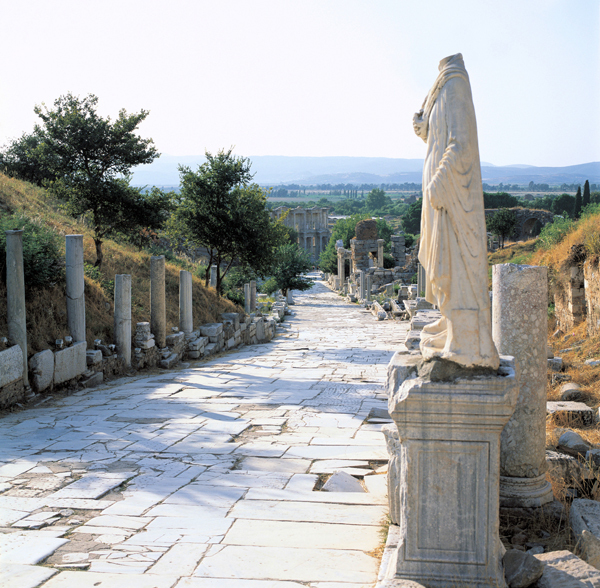 Visit Aphrodisias when traveling between Pamukkale and Ephesus or any point along the Aegean coast. The modern town is Geyre. 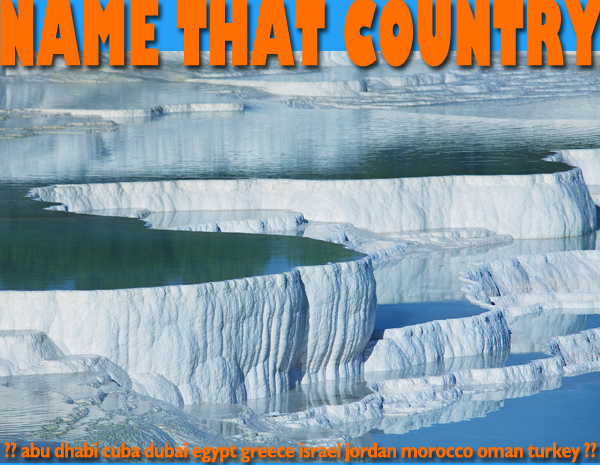 It’s about 50 miles west of Pamukkale and roughly 100 miles from the coast. The small town of Dalyan is tucked into a bend of the Dalyan River on Turkey’s southwest coast, about 50 miles east of Marmaris and 35 miles west of Fethiye. The whole area, around 300 square miles, was established as a Special Environmental Protection Area beginning in the late 1980s. Although the protected status revolves largely around the endangered loggerhead turtle, which nests on a local beach, the area encompasses wetlands, fresh water lakes, rivers, a brackish water zone and rich agricultural lands. Serene in the lap of splendid nature, Dalyan has only to raise its gaze the slightest degree to bring splendid culture and history into its fortunes. 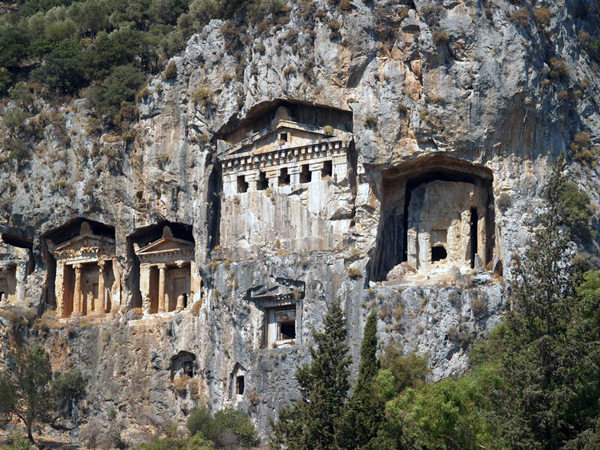 Probably the area’s most famous attraction, the 4th century BCE Lycian tombs hang over the river and town from the sheer face of a scrubby mountain. They are best viewed from the river and opportunities for boat rides are plentiful.